Description: Jessie is a fashionable creative girl, but she's also really into unique art, so why not combine the two? 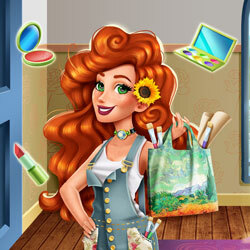 Choose a perfect make-up, and a beautiful outfit inspired by Van Gogh's paintings for her! She'll look amazing in painterly couture and bright vibrant colors!